13 April - 16 August 2016. This spring, artist duo Elmgreen & Dragset will transform the Fifth Avenue entrance to the Channel Gardens at Rockefeller Center with a large-scale new work. Van Gogh’s Ear is a sculpture, which takes the form of a swimming pool sitting upright. Its cyan blue interior, adorned with a polished stainless steel ladder, bright lights, and a diving board, opens up to the public traveling down Fifth Avenue, across from Saks Fifth Avenue. Conceived specifically for this site, where fashion, commerce, tourism, business, and art collide, the work playfully contradicts our expectations of both this familiar object and iconic site. Displayed as if in a high-end retail showroom, the work continues the idea of Marcel Duchamp’s readymades, which debuted a century ago and featured ordinary objects elevated to the level of high art by the choice of the artist. In contrast with these works, which were often only slightly modified, Elmgreen & Dragset have carefully designed and crafted each detail of Van Gogh’s Ear to mimic a garden pool. Re-positioned in a pedestrian plaza surrounded by the busy life of tourists, skyscrapers, and businesses, the pool stands out as a surreal object uprooted from its usual environment. The sculptural elements of the pool itself—from the curves created by the different depths and its overall shape, to the protruding diving board—become apparent when it is singularly presented vertically and above ground. The private pool has had many connotations over the years: a former status symbol for the suburban middle class, a signal of the ultimate in leisure activity, and an emblem for the creation of one’s own private paradise. Oe might draw connections between David Hockney’s series of swimming pool paintings and Ed Ruscha’s photos taken in the mid-1960s and early 1970s. 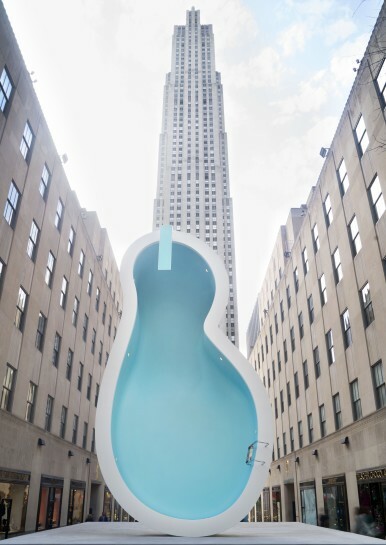 In the context of Midtown Manhattan, however, Elmgreen & Dragset render the pool devoid of function via its displacement, and in turn, prompt a simultaneously more cerebral, poetic, and aesthetic approach to the actual object as well as its setting. “The sculpture recalls the 1950s-style pools found in front of some Californian private homes, in contrast to this very public East coast urban setting. It is as if an alien spaceship had landed in the midst of this prominent and busy environment. One can dream of lazy days under the sun while surrounded by all the traffic and business going on at Rockefeller Plaza. The title Van Gogh’s Ear plays on the mythological versus the ordinary. We thought it was a perfect name for a swimming pool of this shape. It opens up the possibility for a different perception of the form itself. And like the myth of Van Gogh cutting off his ear in despair, the dislocated pool will hopefully make people wonder ‘why?’, and pursue their own reasoning behind this inexplicable scenario,” said Elmgreen & Dragset. Like Elmgreen & Dragset’s previous public project Prada Marfa (2005), a faux Prada store located in the middle of the West Texas desert, Van Gogh’s Ear brings attention to its context through its otherness. The swimming pool motif is closely linked to several of the duo’s other recent works including their iconic Death of a Collector installation for the Danish and Nordic Pavilions at the 53rd Venice Biennale in 2009. The work included the body of a “collector” floating face down in his pool, outside of the two buildings, which the artists conceived of as homes. They have also presented Powerless Structures, Fig. 11(1997) and Powerless Structures, Fig. 13 (2014), a diving board installed to penetrate a window at the Louisiana Museum of Modern Art in Denmark and at the Punta della Dogana in Venice, respectively. Following its presentation at Rockefeller Center, the K11 Art Foundation will travel Van Gogh’s Ear to China.